We were out of town this past week, so we didn't get a chance to catch Mark Gatiss' episode Sleep No More until now, so this will be a very short review. One word of caution: if you are looking for images or information about the episode on Google, you'll come across an apparently adult off-Broadway play by the same name. It's definitely not something you'll want your kids to come across. 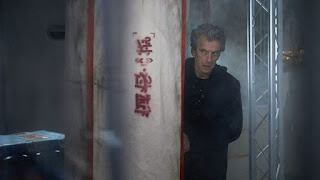 With a nasty monster and with such great footage of Peter Capaldi, one would hope to find this episode a bit more memorable, but it seems to play it by the book and doesn't really venture into any realm of science fiction that hasn't been done before and done well. Probably its saving grace is that Gatiss didn't try to expand the little actual material he had and make it into two episodes. Short and sweet and simplistic, lacking in sophistication or subtlety, the story comes across a bit disjointed at times without any apparent reason behind the logic gaps other than poor script editing. It's a style of writing which seems to be commonplace in the Moffat era and what my author husband has named "The A.D.D. School of New Doctor Who Writing" and why he no longer cares to watch it recently. Thank heavens Retro-TV is still showing the classic series so he can get his fix. The Jon Pertwee series wound up this past week and Tom Baker's mostly well-written series are awaiting us over the holiday season. A very nice Christmas gift indeed. People keep making excuses. Like "it's a very BRAVE episode." and leaving it at that instead of saying, "It's a very brave episode, but would have been braver if they actually tried to DO a "Found Footage" episode rather than something more like X-Files' episode X-Cops." This wasn't "Found Footage", which traditionally consists of uncut raw footage rather than a carefully edited shaky camera montage of the best bits of footage gained from a rather convenient source... that being "Every possible angle in the whole station because of some weird magic that eye bogeys can make happen". Found Footage, while often maligned, requires an incredible attention to detail from the director and DOP, and the edits are essential. This was little more than a badly shot episode of Doctor Who with no beginning or end, and a cheesy zinger as the pay off. Apart from Capaldi holding a bloody big net to catch every loose piece of drivel with his typically fabulous performance there was nothing in this episode that surprised, shocked, or even particularly entertained me. This took the show to a new low in my opinion. I see what you're saying about the "found footage", Tommy. Is it "brave" to put out a less than polished show? I do wonder this season. Is there anyone acting as script editor? Anyone checking scripts for logic gaps and other fixable problems before shooting? They seem rushed... So it's probably why they went with a "rushed" episode with a documentary feel. Lots of potential in New Doctor Who, but it never seems to materialize this season. I was more impressed with Capaldi's first season (minus the opener and the closing episodes and the Dragon egg/Moon episode). Why can't we have another "Flatline" or "Mummy on the Orient Express"?